Your dental health is one of the MOST important components of a long and healthy life and for most, this should start as early as possible. By helping your children learn the importance of going to the dentist at an early age, you’ll set them up for a lifetime of good oral health! What should you expect in their dental progression as your children grow up? People usually think of a newborn baby as having no teeth. But the 20 primary teeth (baby teeth) that will erupt during the first three years already are present at birth in the baby’s jawbones. At birth, most of the crowns (i.e. the white tooth part we see) are almost complete, and the chewing surfaces of the permanent molars have begun forming. Primary teeth are important in normal development – for chewing, speaking and appearance. In addition, primary teeth hold the space in the jaws fro the permanent teeth. Both primary and permanent teeth help give the face its shape and form. A baby’s front four teeth usually come in first, typically at or about six months of age, although some children don’t have their first tooth until twelve or fourteen months. Most children have full set of 20 primary teeth by the time they are three years old. As your child grow, the jaws also grow, making room for the permanent teeth that will begin to erupt at about age six. At the same time, the roots of the primary teeth begin to be absorbed by the tissues around them, and the permanent teeth under them begin to erupt. Typically, children have the majority of their permanent teeth by 12 to 14 years of age. The remaining four permanent molars, often called wisdom teeth, erupt around age 21 to complete the set of 32 permanent teeth. When teeth begin erupting, some babies may have sore or tender gums. Gently rubbing your child’s gums with a clean finger or a wet gauze pad can be soothing. You also can give the baby a clean teething ring to chew on, by never dipped in sugar or syrup. If your child is still cranky and uncomfortable, consult your dentist or physician. contrary to common belief, fever is not normal for a teething baby. If your infant has an unusually high or persistent fever while teething, call your physician. As children develop, their jaws and faces continue to change. The transition from baby teeth to adult teeth is gradual. by the time they reach adulthood, most children will progress from their 20 primary teeth(baby teeth) to 32 permanent (adult) teeth. All the while, the jaw gradually expands to make room for the additional 12 teeth. At about age six, maybe earlier, children begin to lose their front teeth on top and bottom. During the next six or so years, permanent teeth gradually will replace the primary teeth. The first permanent molars usually erupt between ages five and six. For that reason, they are often call the six-year molars. They are amount the “extra” permanent teeth tin the at they don’t replace an existing baby tooth. These important adult teeth are often mistaken for baby teeth. However, they are permanent and must be cared for properly if they are to last throughout the child’s lifetime. The six-year molars are especially important because they help determine the shape of the lower face. They also affect the position and health of other permanent teeth. Begin cleaning the baby’s mouth during the first few days after birth. After every feeding, wipe the baby’s gums either with a clean, wet gauze pad or with a washcloth or towel. This removes plaque and residual food and helps children become accustomed to having their mouth checked. When your infant’s teeth begin to erupt, it is important to clean them regularly. You may continue to use a gauze pad or cloth to clean the incisors after feeding until the back teeth (molars) begin to erupt (usually around 12 months of age). 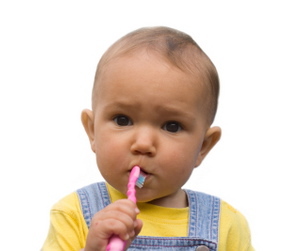 Once a molar appears, brush all teeth gently with a child’s size sort toothbrush and water. Position your child so you can see in to the mouth easily; you may want to sit, resting his/her head in your lap. 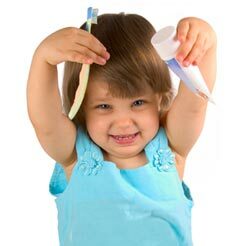 When your child can predictably spit and not swallow toothpaste, begin brushing the teeth with a pea-sized amount of toothpaste. If the toothbrush looks worn, the bristles bent or frayed, it will not remove plaque effectively. Visiting your dentist every 6 months will ensure you get a free replacement twice a year. Flossing should also be encouraged. You may have to do this for the child initially. Remember the gums are very sensitive and snapping the floss between the teeth may negatively reinforce this important cleaning step. If you follow the above recommendations carefully, the first visit with the dentist can be around the age of 2-3. Some recommend bringing in the child at first tooth eruption. This can be a good idea because it enables the dentist and staff to evaluate the development of your child’s teeth and to go over specific questions that you might have. This visit is similar to a well baby checkup with the child’s physician. Complete a thorough oral examination to assess growth and development, oral hygiene, injuries, cavities and oral soft tissue. Review feeding practices and provide dietary counseling. Assess your child’s risk of developing tooth decay. Provide information regarding oral development, teething, pacifier or finger/sucking habits and injury prevention. Plan for any needed treatment or the next check up. Of course we will answer any questions the parents or caregivers may have. The first “regular” dental visit should be just after your child’s third birthday. The first visit is usually short and involves very little treatment. We may ask the parent to sit in the dental chair and hold their child during the examination. The parent may also be asked to wait in the reception area during part of the visit so that a relationship can be built between your child and your dentist. 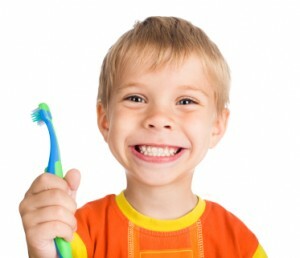 Tooth decay and children no longer have to go hand-in-hand. At our office, we are most concerned with all aspects of preventive care. We use the latest in dental sealant technology to protect your child’s teeth. Sealants are space-age plastics that are bonded to the chewing surfaces of decay prone back teeth. This is just one of the ways we will set the foundation for your child’s lifetime of good oral health. If you’d like your child’s first experience to the dentist to be one they enjoy, contact our office at (513) 96-1573 to schedule an appointment.